The 2018 Connecticut Blanket is Here! The 2018 Connecticut Blankets were picked up at the mill on January 8th and sent on their way to the shepherds who took advantage of the opportunity to get a value added product from their flocks. This year's blanket is named "The Burlingame" after Fenner "Jim" Burlingame who passed away while this edition of the blanket was in progress. Jim was dedicated to any project he took on and his experience with the textile industry was a perfect fit for the Blanket Project. Jim took on the role of Treasurer and when he let us know he would be battling cancer we offered to let someone else take over but he refused and said it would give him something to do. We never knew he was waning until his wife Jane called us to say he had passed. The purpose of the Connecticut Blanket project is to educate members of CSBA, Inc. about wool handling and to assist them in marketing quality wool from their sheep for a reasonable price. Any member can participate in the project if their wool meets the project requirements and have attended a Wool Quality Workshop. For more information on becoming a part of the CT Blanket project contact Sylvia Murray. The Connecticut Blanket was manufactured originally by Charles W. House & Sons in Unionville, Connecticut. The wool for the blanket was collected from Connecticut farms, mostly from members of the Connecticut Sheep Breeders Association. When the company went out of business in 2001, Charles House suggested that CSBA might be interested in continuing the blanket. The CSBA Connecticut Blanket Project began with wool collected in the fall of 2002, producing the first blankets in the winter of 2003 and has continued each year to the present day. Over 2000 blankets have been produced since 2003. 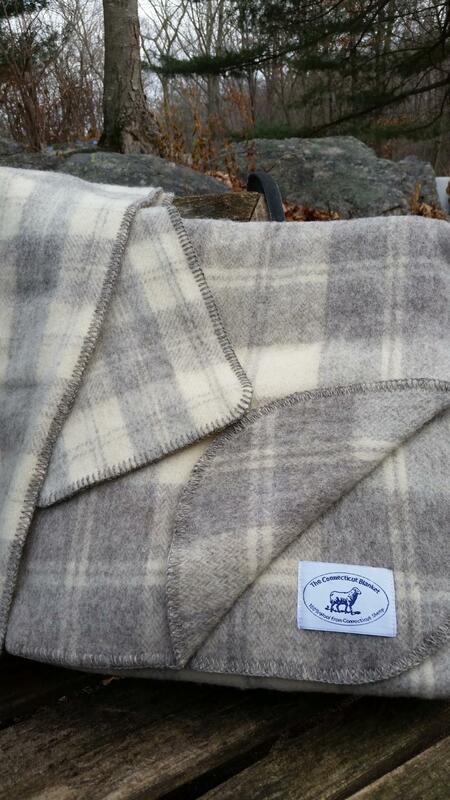 The Connecticut Blanket Project has helped Sheep Associations in Rhode Island and Massachusetts to start producing blankets in their states from their wool. To produce the blankets, the fleeces from each sheep are sheared, skirted, and cleaned individually at each farm which may take about 1 hour per fleece. All the wool is inspected at the University of Connecticut livestock barn, and if the wool is acceptable, it is weighed and packed into tall plastic bags for shipping by a dedicated group of volunteers. Approximately 200 pounds of wool fill each bag. The wool is then shipped out for scouring (cleaning) and then yarn is spun, the blankets are woven, fulled, napped, and cut in seven sizes from baby blankets to king size. Finally, these blankets are distributed to the participants so they can be sold by the shepherds at their farms. The complete list of farms is below. Long Throw 45" x 72"
Each blanket comes with a Connecticut Blanket label and is packed in a zippered plastic bag with a certificate listing the farms. Typically a different balanced pattern of dark and light natural colored wool is chosen each year. Customers not only buy blankets for their own beds, but also buy them for gifts for weddings, birthdays, graduations, showers, retirement, boats, cottages, housewarmings, or stadium. Many blankets are bought for friends or relatives who no longer live in Connecticut. The state-wide project allows sheep producers of both small and large flocks to contribute to the project. So even a shepherd with just a few sheep may be able to get one of these special blankets made for the cost of making the blanket and their wool. Shepherds must know about caring for the wool throughout the year and how to clean the fleece before bringing their wool to the University of Connecticut. There are Wool Quality Workshops scheduled each year for this purpose. Please contact Sylvia Murray via email if you are interested in participating in the 2019 blanket. You can take your blanket to a dry cleaner, dry clean it at home in your dryer with dry cleaning sheets available in the laundry aisle of most stores or wash it at home. To wash it at home follow these simple instructions: Fill your top loading washing machine with lukewarm water and mild detergent (Woolite is good). Push the blanket into the water and let soak for about 20 minutes - DO NOT AGITATE THE WATER AS THIS WILL RUIN YOUR BLANKET - Drain and spin the blanket in the machine, them remove the blanket. Fill the washer with clear lukewarm water WHICH IS EXACTLY THE SAME TEMPERATURE AS THE WATER YOU USED TO WASH THE BLANKET. Push the blanket back in, and let soak for another 10 minutes. Drain and spin. Remove the blanket and air dry - DO NOT PUT THE BLANKET IN THE DRYER. Why you cannot use a front-loading machine Wool felts when it is wet and rubbed together. Agitating the water in a top loader or washing in a front loading machine will cause the wool to felt and will destroy your blanket. Why the wash water and rinse water has to be the same temperature. Changing the temperature of the water is another way to felt your blanket. We recommend dry cleaning for the larger blankets. Washing is better for the baby and throw sizes. Many people do not wash their blankets as they prefer to put one sheet under the blanket and another sheet over the blanket on their beds which will keep the blankets clean. The blankets are aired by hanging them on a line outdoors each spring. The following farms currently have blankets for sale. We have several patterns available in various sizes. Easy online ordering & shipping. We can ship anywhere in the continental 48 states for $20 via insured FedEx. Shipping via FedEx or USPS insured. Money order, check, PayPal or Square. The Burlingame, made from the sheep at UCONN and all of Connecticut are here! We have already sold out of scarves and baby blankets. Get yours before they're gone! Twins in Small Buffalo Plaid; Queen, Long Throw & Throw in Large Split Buffalo Plaid; King, Queen, Twin, Long Throw, Throw & Scarves in Small Split Buffalo Plaid. Copyright 2019 Connecticut Sheep Breeders Association, Inc.. All rights reserved.